Every e-Store owner knows the importance of Live Chat to their site, but perhaps using just words cannot describe how important it is to integrate Live Chat in Magento 2. It provides Real-time Customer Support, boosts sales and generates customer behavior data for further study. Nowadays, there are plenty of Live Chat services for you to choose. In this article, we will guide you through the process to integrate Live Chat in Magento 2 sites. 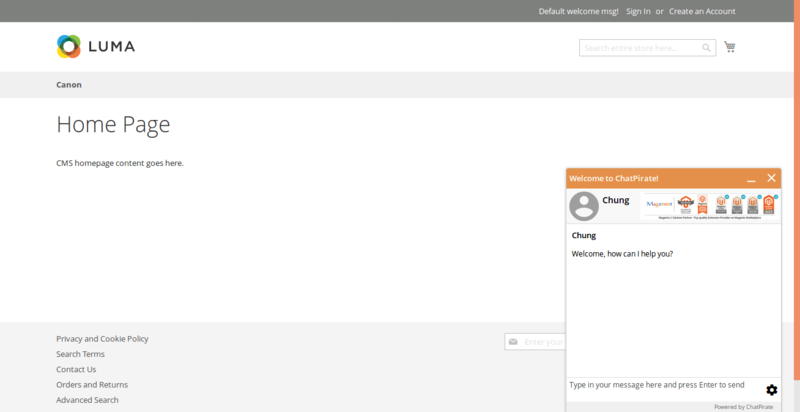 In this section, we set up a module called “LiveChat”. Go to your phpmyadmin, if there is “Magenest_LiveChat” in setup_module, your module is installed. You have just created a live chat menu. In order to go to the configuration, we need to set up the configuration for that link. <group id="livechat" translate="label" type="select" sortOrder="30" showInDefault="1" showInWebsite="1"
<field id="enabled" translate="label comment" type="select" sortOrder="10" showInDefault="1"
<field id="widget" translate="label" type="text" sortOrder="20" showInDefault="1" showInWebsite="0"
Your configuration section is set up. In this tutorial, we use Chat Pirate. Don’t be afraid, the other live chat websites also work in the same way as Chat Pirate. First, sign up an account on https://chatpirate.com/ and go to chat pirate dashboard. Third, copy these codes and save in Widget field in our live chat configuration. Final, click Save Config, a Cache Management notification will appear, you need to refresh all cache by Select All and Submit refresh. Ok, now you have the Widget Codes. All you need to do is running the Widget Codes on the front-end. 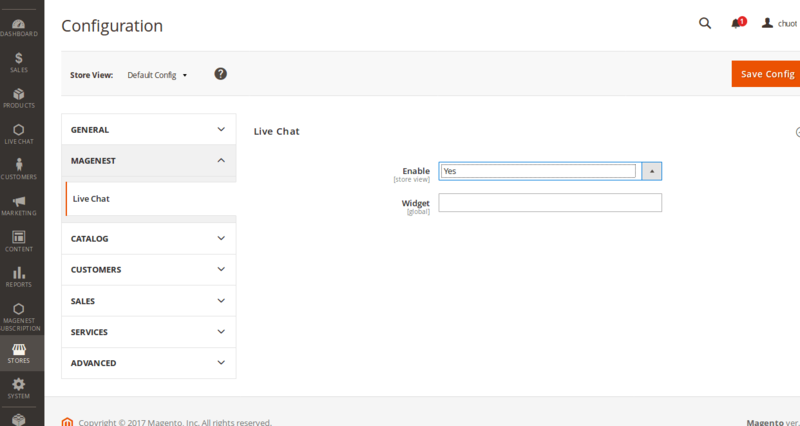 Before you can finally integrate live chat in Magento 2, perform the the last step below. Step 5: Set up front-end. We need to get the Widget Codes from our Configuration. 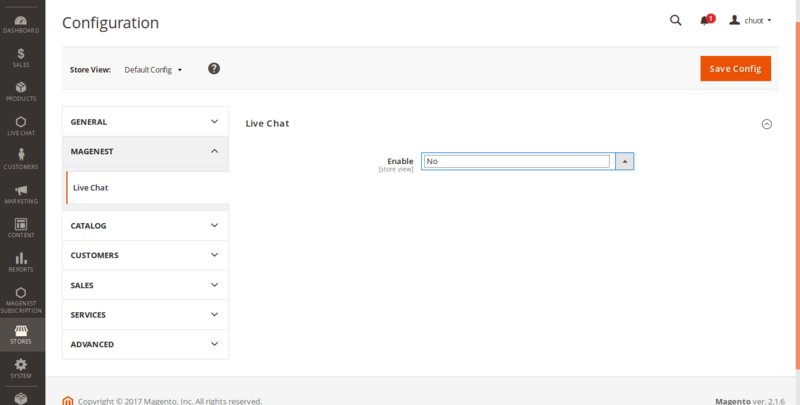 If you don’t want to turn on live chat, just disable it in the live chat configuration. That’s it! 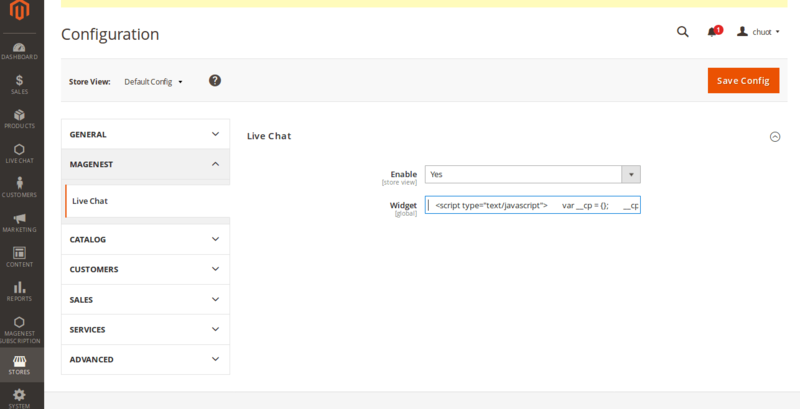 Now you can integrate live chat in Magento 2. The other live chat websites are also based on this operation, so this simple module can be applied easily. If you have any question to this blog, feel free to ask us at the commect section. 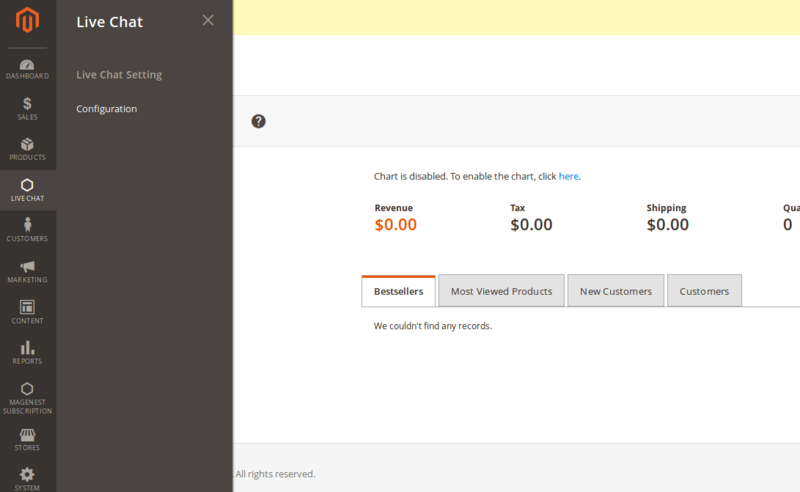 How To Integrate A Live Chat To Magento 2?